In the previous articles, we talked about Italmodular modular shelving solutions and our innovative wine shelvings. Today we’re presenting you our IM 09 line of products. Our commercial shelving systems not only include standard shelves, but also all kinds of alternative systems. We produce a wide variety of necessary supports and infrastructures to stock goods and resources. Italmodular is an innovative company, leader in the sector of commercial shelving systems. It offers its services to customers as a reliable partner in designing highly innovative storing structures. Italmodular’s solutions intelligently rationalize and organize storage space within any workplace. The attention to technology’s advancement, and an optimized human resource management, paired with an international customer support service, put the company well above the competition. Efficiency is a way of thinking: durable and reliable solutions are the strongholds that ensure us such a wide clientele. Meeting and exceeding the demands of each customer is the mission behind our lines of innovative products. Furthermore, we base our reputation on over five decades of experience in the commercial shelving systems sector. Because of that, we grew with the industry and contributed to raise the standards in this sector. As a result, we know exactly what modern companies need. 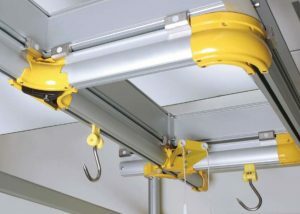 The IM 09 system comprises overhead rails, frames and hooked bars. They are the ideal solution for transporting, hanging up and storing meat inside walk-in cold rooms of any kind and size. Perfect companion for our IM92 and IM97 products lines, these alternative commercial shelving solutions ensure, in terms of space, the maximum results with the minimum investment. 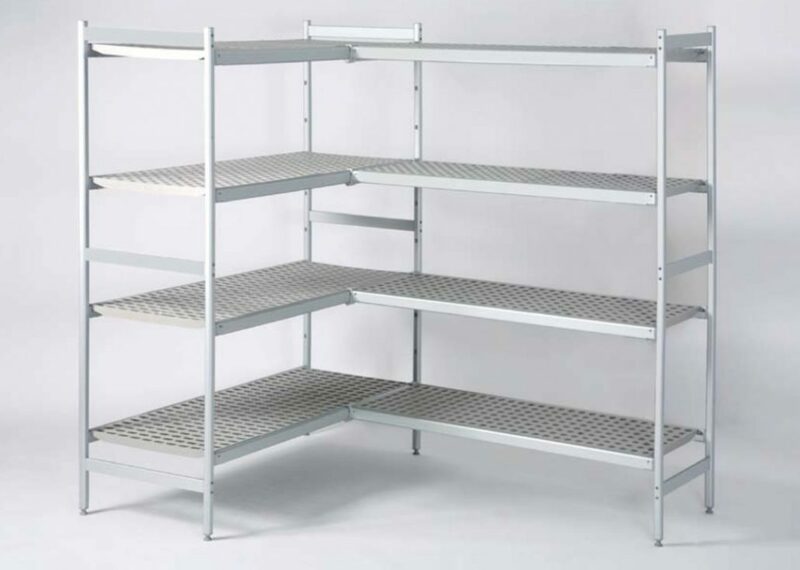 We make our commercial shelving systems entirely from anodized aluminum alloy 12 microns thick and non-toxic plastics, and we guarantee them to offer lasting stability and a high standard of hygiene. A stable, solid sectional system that is quick and easy to install and shows great adaptability, allowing it to cater to a diversity of space requirements. The simplest solution to your transportation problems with all kinds of meat. The IM 09 sectional overhead rail system is the ideal solution for fitting out modern butchery departments. 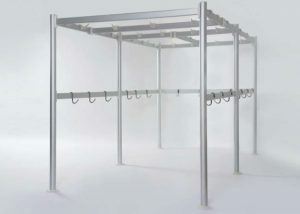 It is also particularly suitable for hanging up, transporting and storing meat inside walk-in refrigerators and processing rooms. The advantages that come with the system are time-saving installation, highly practical use and guaranteed hygienic safety. A sectional, stable, solid system that is built to take the loads and strain, featuring smooth, noiseless gliding. Our commercial shelving systems are absolutely non-intrusive. Quick and simple to assemble, this system provides great adaptability to a whole host of different needs. Moreover, the new three-way switch system patented by Italmodular means that meat can be moved effortlessly in three directions. This provides operators with a supremely practical and safe work space, as well as making changes of direction easier. The IM 09 system self-supporting framework is certified with NF marking. It is a functional solution that is ideal for any kind of refrigerated stocking room. furthermore, you can swap the components around and adapt them to each other as you need. This system is designed to give you unlimited freedom in putting together the framework to meet your individual needs. A modern, stable, solid system that is quick and easy to assemble and food safe according to the relevant regulations in force. The IM 09 system hooked bars make an ideal solution for fitting out and adding the finishing touch to butcher’s shops, delicatessens and supermarkets. This structure is great for any type of environment, as it is very discrete. Its conformation allows it to adapt perfectly to a single wall. 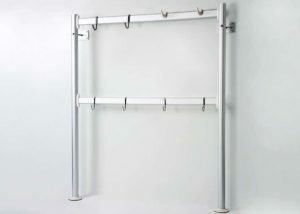 In addition, it is available in various sizes for different load capacities, the range includes sliding or fixed hooks. The various bracket options also mean that you can install the hooked bars on a wall or ceiling and they can be fixed or sliding to suit the specific requirements. Italmodular commercial shelving solutions are always ahead of the competition. If you’re looking for commercial shelving systems, come and visit our website at Italmodular, modular shelving systems.